A day after the CDC announced an ongoing outbreak of E. coli O121 linked to General Mills flour, individual states that have confirmed outbreak cases have started to issue statements of their own. Michigan responded quickly and on multiple fronts, releasing slightly more detailed demographic information for confirmed cases, issuing advice and guidance regarding the use and handling of recalled flour to consumers, and spot-checking retailers to make sure that they have pulled all affected product from their shelves. The CDC outbreak announcement reports four confirmed outbreak cases of E. coli O121 in Michigan. Only Illinois and Colorado have confirmed as many cases as Michigan, and no state has confirmed more. The state’s official departments have been both informative and responsive, and the outbreak have received extensive media coverage. Of the four Michigan residents that fell ill with outbreak cases of E. coli, “two had to be hospitalized,” according to a report in the Detroit Free Press. Those two cases account for 20% of all hospitalizations involved in the outbreak to date. The 50% hospitalization rate for the Michigan cases is higher than the national average of 26%, as ten of the 38 confirmed confirmed cases were hospitalized. In fact, if all Michigan cases are removed from the equation, the hospitalization rate would be a mere 6% (2 of 34 cases). State officials confirmed one case in each of Kent, Ingham, Oakland and Ottawa counties. The largest cities in these counties are Grand Rapids, Lansing, Troy, and Holland, respectively. All confirmed cases in Michigan occurred in adults. The state government is being proactive, taking actions that include actively checking retailers’ supplies. 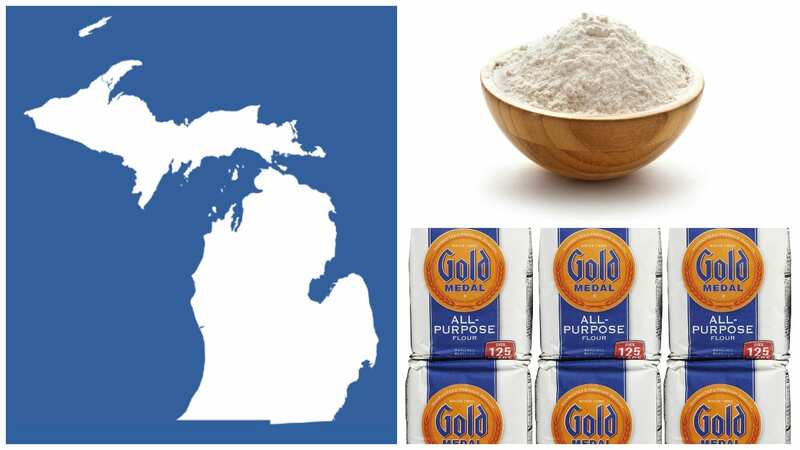 “We’re urging all residents to follow the CDC recommendations when it comes to handling food and making sure that they dispose of recalled flour,” Michigan Health and Human Service spokeswoman Jennifer Eisner said. Symptoms of E. coli O121 infection include diarrhea, which is often bloody, and stomach cramps. According to the FDA, symptoms usually show up 2 to 8 days after an infected person first consumes the bacteria, though the vast majority of people will get sick 3-4 days after eating the contaminated substance. While the majority of people recover within a week of falling ill, some more severe illnesses last longer and may result in hemolytic uremic syndrome (HUS), a type of kidney failure. The elderly, children under the age of five, and people with otherwise compromised immune systems are most likely to develop HUS, though any individual who contracts E. coli O121 may develop the condition. The symptoms of HUS include fever, decreased urination, pale skin, fatigue, irritability, abdominal pain and bruises or bleeding from the nose or mouth. Anyone who is experiencing the symptoms of HUS should immediately seek emergency care. No confirmed cases in the current outbreak have reported HUS associated with the outbreak illness. If you or a family member ate Gold Medal, Wondra, or Signature Kitchen flour and were diagnosed with E. coli, please fill out our case evaluation form or call us toll-free at 1-888-335-4901. One of our attorneys will contact you to discuss your case at no cost to you.